The north African country of Morocco seems to have it all. 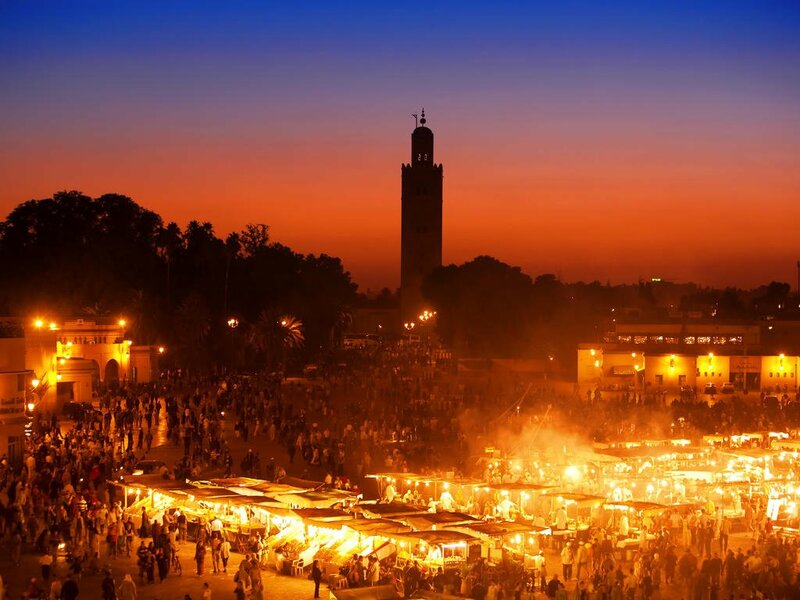 Whether you’re interested in history, culture, landscapes or adventure, Morocco ticks all the boxes. It’s a fascinating place to immerse yourself in, with the saturated colors and amazing scents sure to make an immediate impression on you.Sandwiched between the Atlantic Ocean, Mediterranean Sea and Sahara Desert, Morocco’s landscapes range from beaches to rolling red dunes, and from hills studded with olive trees to the snow-capped Atlas Mountains.The Sahara Desert is naturally irresistible to most travellers. A camel-back or 4×4 visit to the dunes can feel like you’re reliving scenes from either ‘The English Patient’ or ‘Lawrence of Arabia’. 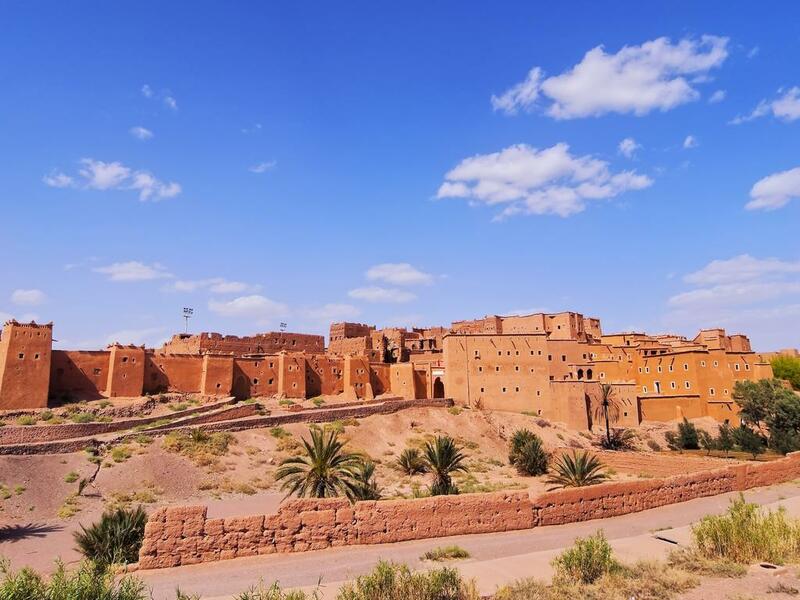 Gazing out over the vast stretches of sand and sky is incredibly soothing for the soul.It is perhaps Morocco’s cities that will resonate with you most, and exploring them is bound to be an experience. Inside the ancient, walled medinas, you could be forgiven for thinking you had stepped back in time, with everyday life continuing much as it has for centuries. You’ll be intrigued by the incredible array of goods on offer, from traditional earthenware cooking pots to richly-colored rugs and leather bags.Take time to enjoy a refreshing cup of mint tea – although poured hot, it seems to have a cooling effect. It’s often served with small, sweet pastries, which you should definitely also indulge in. If the heat and the haggling become a little too much, step inside a riad or traditional Moroccan house. Many of these are now hotels, and their interior gardens with fountains, pools and mosaics are wonderfully cool, even in the middle of the day.Moroccan interior design may look familiar – that’s because this unique blend of rustic and finely detailed elements is very much in vogue. You’ll spot metal lanterns with colored-glass panes, carved wooden doors and low couches and tables – perfect for gathering around to eat.Which reminds us – Moroccan food! Aromatic and delicately spicy, the stand-out dish is a slow-cooked lamb tagine. If you weren’t hungry beforehand, you soon will be when the chef lifts the lid.Traditions are alive and well in this intriguing and sensuous country – the regular calls to prayer from the minarets set the rhythm of the day, and (for women especially) it’s as well to respect local sensitivities and cover your shoulders and legs when away from the beaches. Electrical sockets (outlets) in Morocco are one of the two European standard electrical socket types: The “Type C” Europlug and the “Type E” and “Type F” Schuko. If your appliance’s plug doesn’t match the shape of these sockets, you will need a travel plug adapter in order to plug in. Travel plug adapters simply change the shape of your appliance’s plug to match whatever type of socket you need to plug into.Electrical sockets (outlets) in Morocco usually supply electricity at between 220 and 240 volts AC. If you’re plugging in an appliance that was built for 220-240 volt electrical input, or an appliance that is compatible with multiple voltages, then an adapter is all you need.But travel plug adapters do not change the voltage, so the electricity coming through the adapter will still be the same 220-240 volts the socket is supplying. If you need to use appliances that are not compatible with 220-240 volt electrical input, you will need a voltage converter. CurrencyThe national currency is the Dirham (DH, Dh, or MAD). Dirhams cannot be exchanged or purchased outside of Morocco. As a general guide, divide the Moroccan price by 10 to get a rough estimate of cost in U.S. $ or €. Current exchange rates can be obtained from several Web sites, such as: www.xe.comBankingMon-Thurs 0830-1230 and 1500-1830, Fri 0830-1200 and 1500-1830.Most major credit cards are accepted in larger restaurants, hotels, guest houses and the occasional shop in the souks, with Visa and MasterCard being accepted most widely.Cash can be withdrawn from ATMs in larger towns, although service in smaller towns can be erratic. Most major hotels now have more reliable ATMs.Traveller’s cheques are accepted in some areas but are not advised, as the exchange can be problematic and it can be difficult to find a bank able to cash them, although some of the main tourist hotels offer this facility.Credit CardsVisa and MasterCard are accepted in hotels and by many merchants, although you may get a better price for a cash transaction. Water sources outside main cities and towns may be contaminated and sterilisation is advisable. Bottled water is the best bet and is available everywhere. Milk is unpasteurised, so boil before drinking. Meat and fish should be freshly cooked and served hot. Vegetables are typically served cooked. If eating fruit, try to stick to fruit that can be peeled before eating. Most produce is grown organically, without chemical pesticides or fertilisers but it’s highly likely to have been washed in unsterilized water.Fusion isn’t a new trend in Morocco, where the cuisine is a blend of Mediterranean, Arabic, Jewish, Persian, West African and Berber influences. Meals range from the diffa, an elaborate multicourse feast featuring couscous and grilled meats, to quick brochettes (kebab) from a roadside stall. Produce is seasonal, grown locally and typically without chemical pesticides or fertilisers.Tagines, the fragrant stews of meat, vegetables or fish, named after the distinctive conical earthenware vessel they’re cooked in are the Moroccans main staple. Flavours revolve around a subtle array of spices, and traditionally every spice shop would have its own secret ras el hanout spice blend recipe.Restaurants range from buffet diners to high-end establishment serving gourmet fare. Many now offer à la carte menus and a three-course fixed-price menu is still common at dinner. Restaurants in cities and large resorts are cosmopolitan, offering a good selection of cuisines, including typical Moroccan fare, plus French, Italian, Spanish and fusion dishes.The best way to experience the true flavour of Moroccan cuisine, however, is to sample the street food. 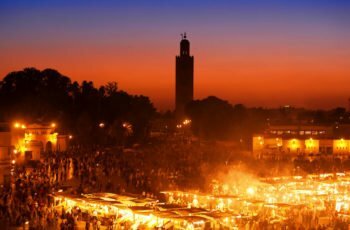 Djemaa el Fna square in the centre of Marrakech sees an explosion of pop-up food stalls after dark, and most other cities have their own foodie quarters. Scrumptious local specialities such as almonds, olives and a rainbow array of spices can be found in souks across the country.Laws on alcohol are fairly liberal (for non-Muslim visitors) and bars in most tourist areas stay open late. Wines, beers and spirits are available to tourists. Muslims are forbidden to drink alcohol. By law, no-one is allowed to drink alcohol in view of a mosque or during Ramadan, although tourist establishments sometimes flout this rule. Locally produced wines, beers and mineral waters are reasonably priced, but imported drinks tend to be expensive.Note: If you have food allergies or are on a special/restricted diet, please notify your travel agent or our office in advance, so that we may try to comply with your needs. Water sources outside main cities and towns may be contaminated and sterilisation is advisable. Bottled water is the best bet and is available everywhere…. Morocco’s climate is very diverse, varying with the season and region. In general the country has a tropical climate, with temperatures reaching as high as 35°C (95°F) and as low as 5°C (41°F) in the Sahara. The coast has a warm, Mediterranean climate tempered on the eastern coast by southwest trade winds whilst inland areas have a hotter, drier, continental climate. In the south of the country, the weather is very hot and dry throughout most of the year, though temperatures can drop dramatically at night, especially in the months of December and January.Rain falls from November to March in coastal areas, and the country is mostly dry with high temperatures in summer and a cooler climate in the mountains. 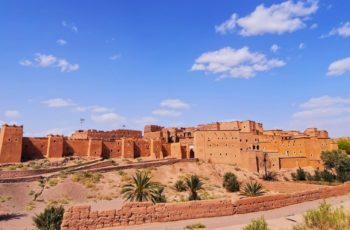 Marrakech and Agadir enjoy an average temperature of 21°C (70ºF) during the winter.Owing to the relatively high winter temperatures, and summers that are dry rather than unbearably humid, Morocco is an all-year round destination. If you really want to avoid the heat, the best time to visit is during the shoulder seasons of April to May, and September to November. The high-speed toll roads connecting Tangier, Rabat, Casablanca, Meknes, Fes, Marrakech and El Jadida are of excellent quality. Coastal communities and most large towns are also well served by good roads. In the interior, south of the High Atlas Mountains, road travel becomes much more difficult, especially across the Atlas Mountains in winter.International and local car hire companies have offices in major towns, cities and airports. Car hire is generally expensive, and prices vary with the season. The minimum age for driving a hired car is 18, although many hire companies will require drivers to be 21 or over.Metered petit taxis are available in major towns. Taxi drivers are not usually tipped, although it is common to round fares up at least to the next dirham on short trips. Larger, grand taxis are usually Mercedes cars, used for travel outside medinas and to areas outside towns. These can be shared, but fares should be agreed before departure as they don’t have meters.Bike hire is available in most major towns – although attempting to cycle through city traffic is inadvisable. For those travelling longer distances, bikes can be transported on trains and buses.Making use of the extensive bus network is the cheapest and most popular way to get around Morocco. Buses serve most communities, and private operators compete for custom on the more popular routes. The major bus companies are Compagnie de Transports Marocains (www.ctm.ma), Trans Ghazala (0536 685 387), and ONCF (www.oncf.ma). There are extensive bus services in Casablanca and other main towns. Pre-purchase tickets are sold.Traffic drives on the right in Morocco and the wearing of seatbelts is compulsory. The speed limit is 40kph (25mph) in cities and built up areas, rising to 80km (50mph) on more major roads, up to 120km (75mph) on motorways. No alcohol at all is allowed in the bloodstream when driving.Foreign driving licences are accepted, as well as International Driving Permits. Third Party insurance is required. Insurance documentation and a licence must be carried with you at all times. Insurance can be arranged locally.The Moroccan rail system, run by Office National des Chemins de Fer (ONCF) (www.oncf.ma) provides regular services. The network runs from Oujda in the northeast to Casablanca on the west coast, Tangier on the north coast and Fes and Marrakech in the interior. 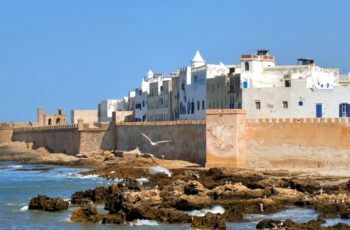 However, only a small part of the country is served, and even large centres such as Agadir and Essaouira are not covered. Lightweight cottons and linens are best worn during summer, with warm medium weight wear for the evenings, during the winter, and in the mountains. Waterproofing is advisable in the wet season, particularly on the coast and in the mountains. Both men and women should be careful to wear clothing that is cognisant of cultural sensitivities – long sleeves and low hems will be looked on favourably. Sunscreen, a sunhat and sunglasses are essential especially in summer. Morocco is quite safe from a health point of view; however, some precautions will ensure a healthy, enjoyable trip. No vaccinations are required for travelers and there is little risk of contracting anything other than sunburn or an upset stomach. Besides sunscreen, we recommend you bring an intestinal medicine such as Imodium or Pepto Bismol just in case. ENTRY REQUIREMENTS Make copies of all your important documents such as passports, driver’s licenses, credit cards, etc. Keep copies with you and back at home. If anything is lost or stolen this will be a lifesaver.Passport:Passports must be valid for the duration of the stay. Please ensure you have at least one blank visa page (not endorsement pages) in your passport.Visa:U.S. citizens do not require a visa. Non U.S. citizens should consult with your local embassy. 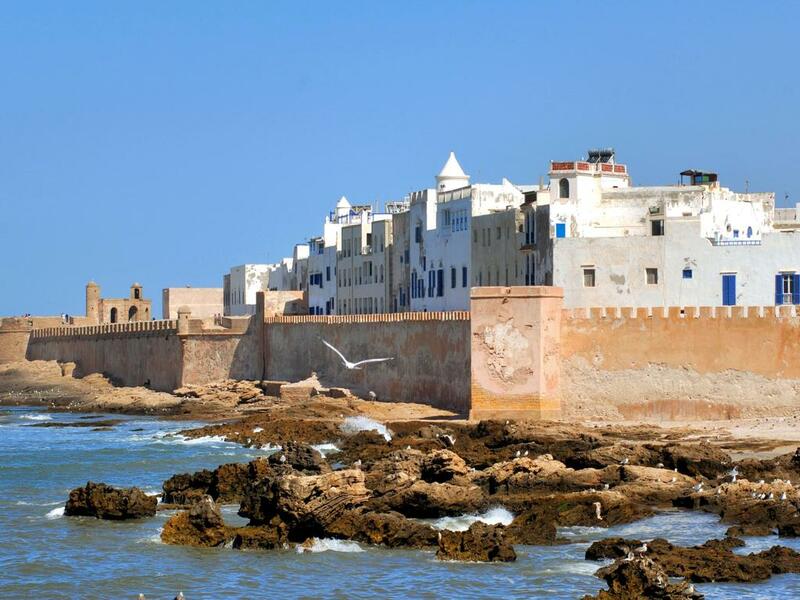 Language:The official languages are Arabic (Moroccan dialect) and Berber, a language of the original inhabitants of Morocco, prior to Arabic expansion….